Students in an English elective work with teacher Katie MacDonald. 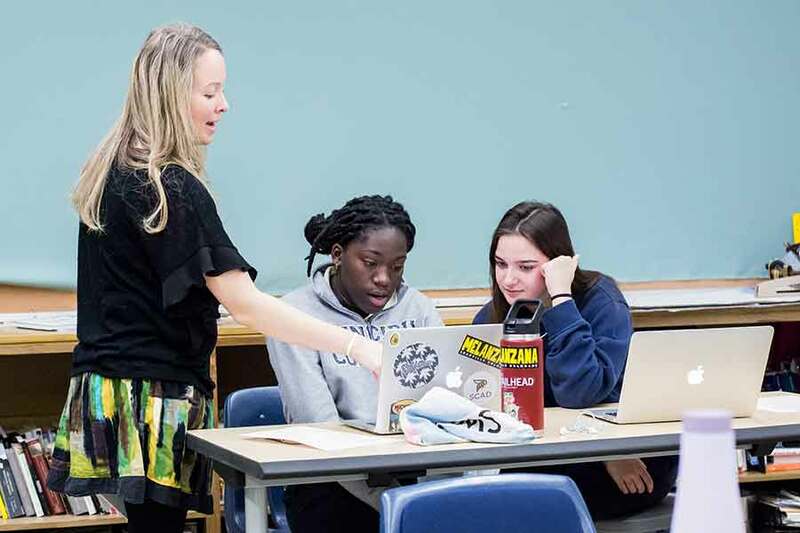 “We’ve been convinced that when students are given more choice in what they study, their interest goes up, and engagement and investment seem to be higher,” observes Katie MacDonald (C’05), Upper School English Department chair. Students in English 1 and 2 (freshmen and sophomores, respectively) chose from three elective areas—Shakespeare Studies, Project-Based Writing, and Visual Literacy. Students in English 3 and 4 (juniors and seniors) chose from Advanced Storytelling, Drama Studies, Marginalized Voices, and Poetry Studies. Juniors and seniors taking AP English courses will continue in their yearlong curriculum prescribed by the AP system. However, some of those whose schedules allow it have chosen to add an English elective to their AP course load.